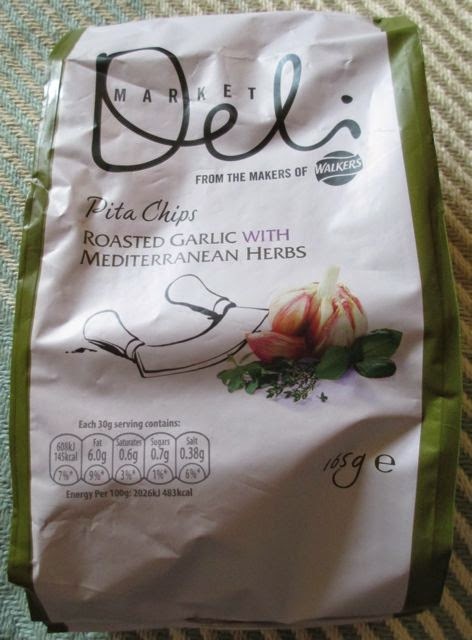 These pita bread chips are from the Market Deli range from Walkers. It's an odd flavour with Garlic being so predominant it's not something I've seen as the main taste before on a pack of crisps. 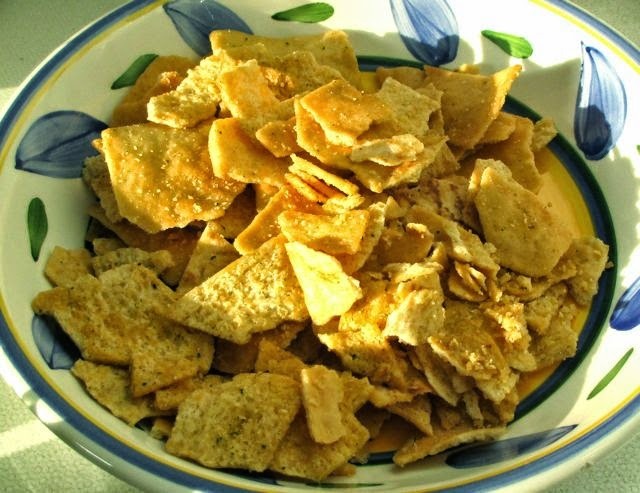 We treated them as a bag of sharing crisps but in reality they are made from squares of pita bread, baked until crunchy and seasoned. This makes them thicker than potato crisps and as such would hold a dip really well. I imagine that loaded with a dollop of tzatziki or guacamole these would be heaven. We had them with some sandwiches though as we didn't have any dip in, and so they were a lunch time accompaniment. I liked the appearance of the pitas, they were mostly square cut but they had broken into different shapes along the way. The aroma from the bag was very garlicky, these aren't the crisps to eat before going to an important meeting, but as someone who loves garlic I was keen to tuck in. Although thick the texture wasn't too hard, they just had a pleasing crunch. The garlic flavour was strong but it had a gentle sweetness and there was lovely aftertaste of Italian herbs, mainly Basil which gave these a nice finish. The funny thing with garlic is that you very quickly become accustomed to its flavour and as such the herb taste made its way into the foreground the more you ate giving these a very Mediterranean feel. In reality the garlic was still on my breath though, as it always lingers there!